The ancient South American grain quinoa is protein rich, it provides all the 9 essential amino acids. It’s also a great source of magnesium and other important nutrients. This healthy salad recipe is delightfully refreshing by as we use ingredients from the Americas like peppers, corn and tomatoes. 1. 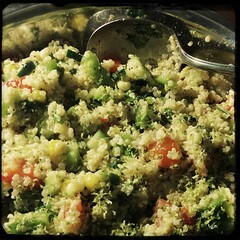 Use a very large mixing bowl, add the pre-cooked quinoa. 4. Mix in the green onions.